On November 2, 1983, President Ronald Reagan signed the legislation establishing a federal holiday for the birthday of Martin Luther King Jr., to be celebrated each year on the third Monday in January. As the legislation that passed Congress said: "such holiday should serve as a time for Americans to reflect on the principles of racial equality and nonviolent social change espoused by Martin Luther King, Jr.." Of course, the case for racial equality stands fundamentally upon principles of justice, not economics. But here are five economics-related thoughts for the day excerpted from past posts, mostly but not entirely during the last year. A half-century ago, white men dominated the high-skilled occupations in the U.S. economy, while women and minority groups were often barely seen. Unless one holds the antediluvian belief that, say, 95% of all the people who are well-suited to become doctors or lawyers are white men, this situation was an obvious misallocation of social talents. Thus, one might predict that as other groups had more equal opportunities to participate, it would provide a boost to economic growth. Pete Klenow reports the results of some calculations about these connections in "The Allocation of Talent and U.S. Economic Growth," a Policy Brief for the Stanford Institute for Economic Policy Research. Here's a table that illustrates some of the movement to greater equality of opportunity in the U.S. economy. White men are no longer 85% and more of the managers, doctors, and lawyers, as they were back in 1960. High skill occupation is defined in the table as "lawyers, doctors, engineers, scientists, architects, mathematicians and executives/managers." 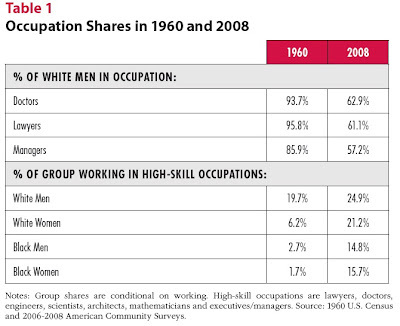 The share of white men working in these fields is up by about one-fourth. But the share of white women working in these occupations has more than tripled; of black men, more than quadrupled; of black women, more than octupled. Moreover, wage gaps for those working in the same occupations have diminished as well. "Over the same time frame, wage gaps within occupations narrowed. Whereas working white women earned 58% less on average than white men in the same occupations in 1960, by 2008 they earned 26% less. Black men earned 38% less than white men in the typical occupation in 1960, but had closed the gap to 15% by 2008. For black women the gap fell from 88% in 1960 to 31% in 2008." 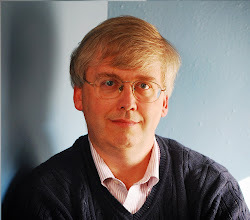 With this framework, Klenow can then estimate how much of U.S. growth over the last 50 years or so can be traced to greater equality of opportunity, which encouraged many in women and minority groups who had the underlying ability to view it as worthwhile to make a greater investment in human capital. There have been four large national-level paired testing studies of housing discrimination in the US in the last 40 years. "The largest paired-testing studies in the United States are the Housing Market Practices Survey (HMPS) in 1977 and the three Housing Discrimination Studies (HDS1989, HDS2000, and HDS2012) sponsored by the U.S. Department of Housing and Urban Development (HUD)." Each of the studies were spread over several dozen cities. The first three involved about 3,000-4,000 tests; the 2012 study involved more than 8,000 tests. The appendix also lists another 21 studies done in recent decades. Overall, the findings from the 2012 study find ongoing discrimination against blacks in rental and sales markets for housing. For Hispanics, there appears to be discrimination in rental markets, but not in sales markets. Here's a chart summarizing a number of findings, which also gives a sense of the kind of information collected in these studies. 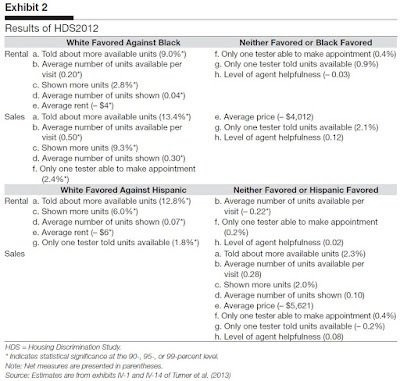 However, the extent of housing discrimination in 2012 has diminished from previous national-level studies. Oh and Yinger write (citations omitted): "In 1977, Black homeseekers were frequently denied access to advertised units that were available to equally qualified White homeseekers. For instance, one in three Black renters and one in every five Black homebuyers were told that there were no homes available in 1977. 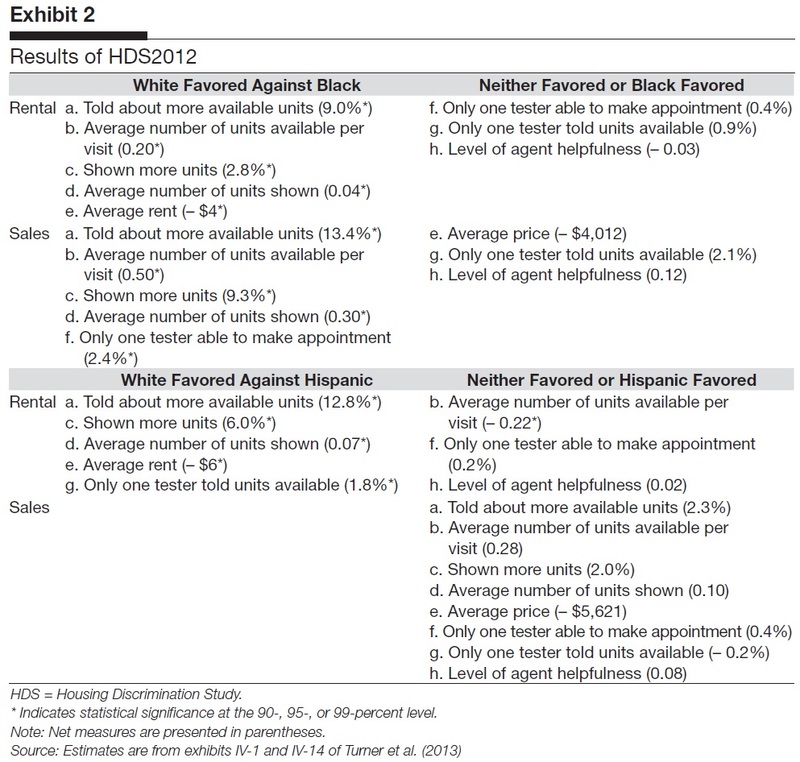 In 2012, however, minority renters or homebuyers who called to inquire about advertised homes or apartments were rarely denied appointments that their White counterparts were able to make. "However, the inequality between cities with the highest and lower poverty rates narrows considerably over this 18-year period. Here we observe a narrowing of both the ratio of crime rates as well as the absolute difference. Expressed as a ratio, the 1990 violent crime rate among the cities in the top poverty decile was 15.8 times the rate for the cities in the lowest poverty decile. By 2008, the ratio falls to 11.9. When expressed in levels, in 1990 the violent crime rate in the cities in the upper decile for poverty rates exceeds the violent crime rate in cities in the lowest decile for poverty rates by 1,860 incidents per 100,000. By 2008, the absolute difference in violent crime rates shrinks to 941 per 100,000. We see comparable narrowing in the differences between poorer and less-poor cities in property crime rates. ... "
Agan and Starr carried out an experiment. They sent out about 15,000 fictitious online job applications to entry-level positions in New Jersey and New York city, both before and after the "ban-the-box" policy went into effect. The resumes were set up in pairs, so that they were largely the same resume except for a difference in race; in particular, out of each pair, one job applicant could be identified as white and one as black. In addition, some of the pairs of hypothetical applicants checked "the box" early on, while others did not; some had a high school diploma, or a GED high-equivalency, or neither; some had a gap in their job history, while others did not. conviction are 62% ... more likely to be called back than those with a conviction, averaged across races ..."
However, when ban-the-box (BTB) was enacted, the black-white gap in the chances of being called back got larger, not smaller. "Our estimates of BTB’s effects on callback rates imply that BTB substantially increases racial disparities in employer callbacks. We find that BTB expands the black-white gap by about 4 percentage points, multiplying the gap at affected businesses by a factor of about six. In our main specification, before BTB, white applicants to BTB-affected employers received 7% more callbacks than similar black applicants, but after BTB this gap grew to 45% ..."
Thanks to Catherine Rampell for pointing out to me that there's another recent empirical study of ban-the-box, different methods, but similar results. The study is "Does "Ban the Box" Help or Hurt Low-Skilled Workers? Statistical Discrimination and Employment Outcomes When Criminal Histories are Hidden," by Jennifer L. Doleac and Benjamin Hansen, published as NBER Working Paper No. 22469 (July 2016). ... Thanks to Stan Veuger for pointing out yet another recent working paper on this subject, which uses a different approach and emphasizes a different set of tradeoffs. In "No Woman No Crime: Ban the Box, Employment, and Upskilling," Daniel Shoag and Stan Veuger look at employment with a focus on the outcome of ban-the-box an employment rates of those living in high-crime neighborhoods. But freedom is not enough. You do not wipe away the scars of centuries by saying: Now you are free to go where you want, and do as you desire, and choose the leaders you please. You do not take a person who, for years, has been hobbled by chains and liberate him, bring him up to the starting line of a race and then say, "you are free to compete with all the others," and still justly believe that you have been completely fair. Thus it is not enough just to open the gates of opportunity. All our citizens must have the ability to walk through those gates.Johnson's comment contains a deep truth, but the poetic phrasing about starting lines of races and walking through gates of opportunity offers a hint that practical difficulties are being sidestepped. Overall, it seems that the distinction between equality of opportunity and equality of result can be the starting point for some minimum level of public policy to reduce certain causes of unequal outcomes. But given the analytical problem with separating why unequal results occur, the equality of opportunity/equality of result distinction is often not much help in resolving how aggressive such inequality-reducing policies should be. How Did the Misery Index Become Irrelevant? Trade: Engine or Handmaiden of Growth? Want to Watch Some Economists Talk? A New Era of Price Discrimination?